A motherboard, also known as the mainboard or system board, is the main Printed Circuit Board(PCB) in a PC. It is likened to the mother of the PC and viewed as a caretaker, controller, holder and connection point of everything that is needed to run the computer. It enables the integration and control of other components and devices that make a complete computer system. A motherboard is like a large city with many neighbourhoods, shopping centers, banks, streets, etc. It has a transport system called the bus, on which data and information is transported. A motherboard is of critical importance to the systems connectivity and performance. A fully assembled and complete motherboard sitting inside a PC. The first consideration to make is the form factor of the board. A motherboard’s form factor determines its size and features for compatibility with processors, power supplies, cases and expansion cards. ATX is the most popular form factor which has been there for a long time and seen many improvements. 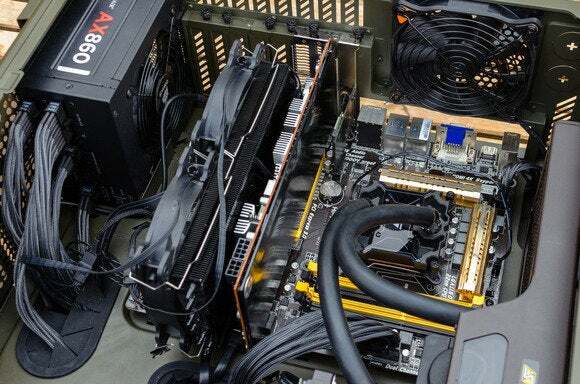 BTX is a newer form factor in which the case has fans on the front and rear that help to force air over the processor heat sink. 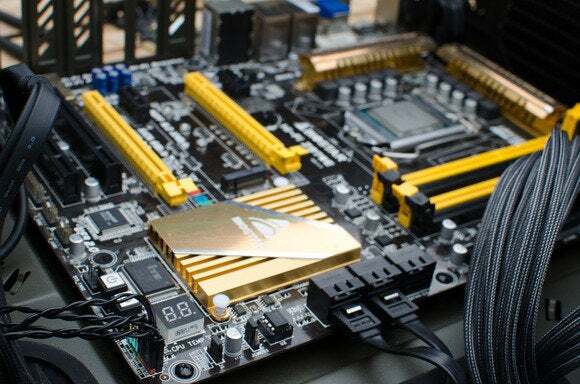 The motherboard determines many features on your PC and selection of the right one should be done with a bit of thought. 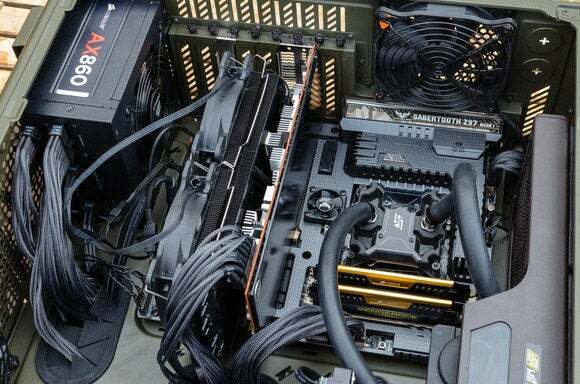 There are three approaches to selecting a motherboard, depending on the peripheral devices and applications that you plan to use with the computer. One approach is to focus on expansion capability whereby you choose a motherboard that allows the most room for expansion, upgrading, adding or exchanging components easily. A second approach focuses on the computer’s current configuration and involves selecting a motherboard that suits the current configuration. However, in case of future need for an upgrade, you will most likely purchase a new motherboard. The third approach combines the first and second approach. Using this approach, you select a motherboard that meets present needs and provides moderate room for expansion. 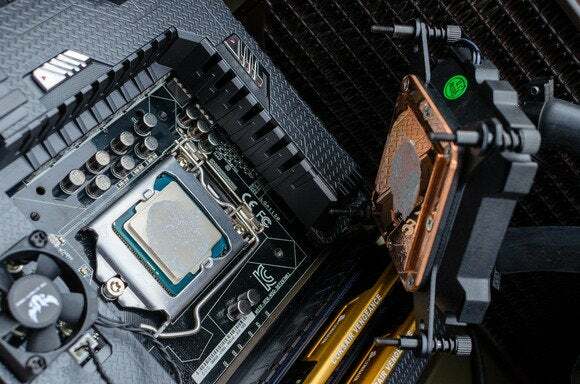 Ensuring your motherboard’s socket is compatible with your processor is key. 1. Does it support the type and number of processors you plan to use? 2. Which chipset does the motherboard use? 3. What type of memory is supported and how much of it can the board hold? 4. How many expansion slots of what type are on the board(e.g. AGP, PCI, and PCI Express)? 5. What devices are embedded on the board and what connectors and internal slots does the board have? There could be a network port, FireWire port, wireless antenna port, modem port, two or more USB ports and so on. 6. What BIOS type does the motherboard use? 7. What is the board’s warranty? Let us now install a JNCS motherboard bundle into an ATX case, as a guide on how installation is done. Standoffs, screws and other hardware do not come with the motherboard. They are provided separately with the case by the manufacturer. The standoffs must line up exactly with the holes on the motherboard. Extra standoffs are removed to avoid the undesirable effects they may cause on system stability and performance. The case may be equipped with makeshift standoffs as raised screw holes. The case may come with a default I/O shield that can be used with even 5-year old motherboards. However, new motherboards now provide their own custom I/O shield. Remove the default I/O and install the one provided by the motherboard manufacturer. In case you purchased a motherboard bundle or clearance motherboard, you can go out without an I/O shield or you can fashion one out of a non-conductive material. Put the motherboard on top of the standoffs and slide external port headers through the ports on the I/O shield. Line up the standoffs with the motherboard holes and drive the corresponding screws through the holes into the standoffs. Make sure you use a screw that fits best for each hole. There are two twisted wires running from the power switch in the front on the case. These wires end in a plastic header with a label similar to iPower SWi. Connect the header to the two corresponding pins on the motherboard. You can consult the diagram on the motherboard manual as the location of the pin may vary with the motherboard or they might not have been labeled clearly. Other headers need to be connected too, for example the reset switch, hard disk LED and power LED. If the LEDs fail to illuminate even after connection to their respective pins, flip them 180 degrees. Diodes only allow flow of current in one direction. You can also connect FireWire ports, USB ports or audio on the front case, each time consulting your manual in case you are not sure about the appropriate wiring. 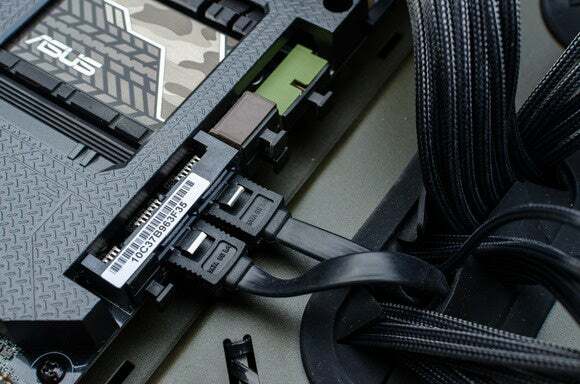 SATA cables connected to a motherboard. 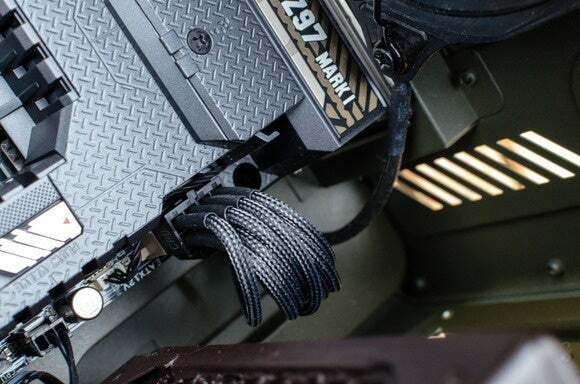 After you have installed drives into your case, run cables from the drives appropriately to the channels first. If there are 2 SATA ports on your motherboard, connect the hard disk to SATA1. You can use SATA2 with another SATA device, in case you have one. Same convention applies to IDE. If you have two IDE devices, the hard disk utilizes the lower number. When connecting the floppy cable, one end goes into the motherboard and the other goes into the floppy drive(usually the twist). A motherboard’s 8-pin power connector. A video card is needed, at least. You can choose to install a sound card or not since most modern motherboards have this feature. 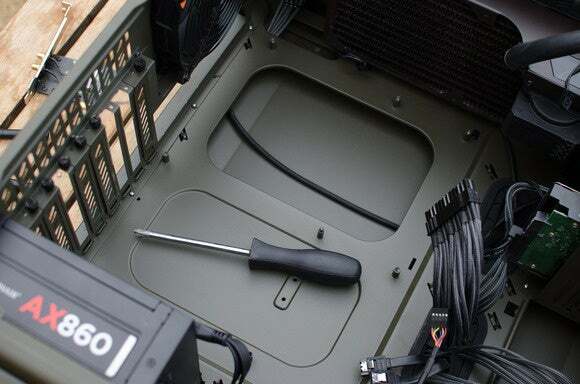 Installation involves inserting the card into the slot and securing it to the case with a screw. The card type must match the slot type: a PCI-Express card should be installed into a PCI-Express slot and an AGP card into an AGP slot. Your motherboard manual explains the various types of slots. Removing the CPU cooler from the processor. 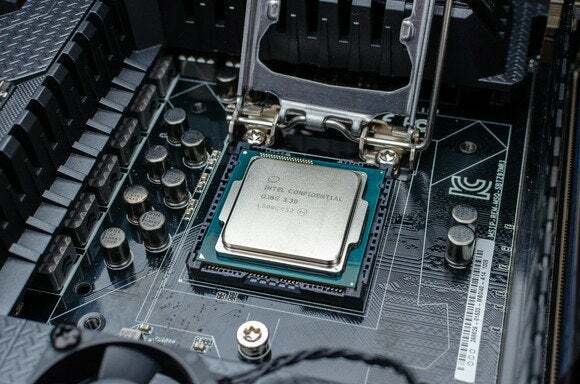 After doing everything the right way, your PC will have been awarded a new motherboard and you can go ahead to check whether your objectives on system performance and so on have been achieved. A completed motherboard sitting inside a PC case. Instead of installing and maintaining software, you simply access it via the Internet, freeing yourself from complex software and hardware management. What you think? First of all I want to say excellent blog! I had a quick question which I’d like to ask if you do not mind. I was curious to know how you center yourself and clear your thoughts prior to writing. I’ve had trouble clearing my thoughts in getting my thoughts out. I truly do take pleasure in writing however it just seems like the first 10 to 15 minutes are usually wasted just trying to figure out how to begin. Any ideas or hints? I really like it whenever people gathering and share thoughts. Great website, continue the great work! webpage or even a blog from learn to end. I tried and it is pretty easy, thanks for tips!